Ayre & Oxford Inc. is a Professional Real Estate Management Company in business since 1995 and now employing over 230 people managing over 180 properties comprised of Condominiums, Commercial, Residential and Home Owner Associations in Alberta. The Company is owned and operated by the Management Team. At Ayre & Oxford Inc. we value our employees and strive to provide an environment that allows them to meet their goals and objectives within our corporate structure. We are extremely fortunate and proud to have such a dedicated group working together. People are the key to our company's success. Ayre & Oxford Inc. is a healthy place to work. Employees have an interest in the success of the company. Various employee programs are instituted such as an employee benefit package, free educational courses, personal time off and a profit share plan. The above areas reward performance as well as provide a creative, professional atmosphere that is fun to be associated with. Of more importance, the atmosphere created, causes staff to strive and take that extra step that is necessary, to meet the objectives of the clients of Ayre & Oxford Inc.
Our Management Team is prepared to handle all of your needs, whether your property is well maintained, requires immediate Capital planning, has accounting issues to resolve, or is simply in need of qualified personnel on site with attention to detail. Simply stated, Real Estate Management is an economic service designed to create the highest possible net return to ownership, over the longest period of time. Proper management techniques will enhance the value of the Real Estate through higher occupancy ratios, reduced turnover, reducing and controlling operating expenses, and lengthening the economic life of the property. These factors combined, pay off to ownership in bottom line performance. Professional Real Estate Management makes good business sense. Investors and/or owners turn to management organizations for a number of reasons. A large number of Investors lack the skill, information, experience or background to allow them to make sound Property Management decisions. Others lack the time to devote to the management process and the situations that can develop. If the management function is neglected or improperly performed, the Investor will soon realize that the problems created demand a disproportionate share of his time. More important, the earnings foregone and the harmful effects on the future operations of the property can be significant. Property Owners must therefore assess the benefits of proper Real Estate Management. In the long run, Property Management pays; as does all wise and prudent investments. Continue to develop a profitable, professional and hands on Real Estate Management organization, recognized by Building Owners and the Real Estate community as an innovative industry leader. To provide uncompromised service to the client (property owner) and the client's customer (tenant) by respecting and treating the customer as a partner, and by so doing satisfying the needs of the tenant, to meet the goals and objectives of the client and thus the agency. 1. As a Professional Real Estate Management company to provide the Property Owner with the best possible net return in a manner consistent with the Owners objectives. 2. To provide quality, hands on service to clients. 3. To view the tenant as the client's customer and to treat the tenant as a partner in terms of satisfying their needs and wants. 4. To meet the goals and objectives of the client and thus the agency. 5. To create a rewarding corporate culture that causes employees to take the extra step necessary to meet the objectives of the client. As Agents we act on behalf of the Property Owner and have a duty to represent that Owner. Therefore the objectives of Ownership have a direct effect on the purpose of management. The majority of Owners are Owners by choice and are therefore typically profit oriented. It is therefore very important that we understand the Owners objective and tailor a management plan that addresses the Owners stated objective. A management plan focuses on the property as it currently exists, both physically and economically. Secondly, in light of economic trends and projections, the report determines what may reasonably be expected from the property in the foreseeable future. The last portion of the report recommends a course of action necessary to achieve the future goals set out for the property. After consultation with the Owners, to ensure Owners objective will be met, the Plan is put into action. The Management Plan allows us to know the subject property, present realistic goals and objectives for the property, and to begin taking the action necessary to achieve those goals. Thus, our approach encompasses not only the day-to-day administration of the property, but the management of the investment that the property represents. February 4th, 2014, Ayre & Oxford Inc. earned the ACCREDITED MANAGEMENT ORGANIZATION ® (AMO®) accreditation from the Institute of Real Estate Management (IREM®), an affiliate of the National Association of REALTORS®. The AMO® accreditation is awarded to real estate firms that have a track record of high performance, experience, stability and financial accountability and have a CERTIFIED PROPERTY MANAGER ® (CPM®) directing and supervising the real estate management team. In addition, AMO® firms must abide by a rigorous Code of Professional Ethics that is strictly enforced by the Institute. Ayre & Oxford Inc. is one of nearly 550 elite firms to hold this prestigious accreditation awarded by the Institute of Real Estate Management. Earning the AMO® accreditation tells owners, investors and clients that their properties are in the best possible hands. The addition of Ayre & Oxford brought the number of AMO® Firms in Canada to five. The Accredited Management Organization accreditation is the only recognition of excellence given to real estate management firms, and the requirements are now more relevant than ever to real estate managers, their clients, and the assets they manage. To earn the AMO® accreditation, real estate management firms must now meet even more standards and abide by a new AMO® Code of Professional Ethics - all based on Best Practices: Real Estate Management Service. These best practices provide a reasonable framework for the professional delivery of real estate management services meaning AMO® Firms can demonstrate to investors and clients that they don't just meet the industry standards... they set them. A number of Ayre & Oxford Inc Staff also hold several Designations through IREM® and The Real Estate Institute of Canada (REIC®), such as CPM ® Certified Property Manager, FRI® Fello of the Real Estate Institute and ARM® Accredited Residential Manager. All AMO® Firms must abide by the Accredited Management Organization Code of Professional Ethics, which is stringently enforced by IREM. The AMO Code regulates such vital areas as duties and relationships with clients, the public, and others in the industry. Complaints may be filed against an AMO Firm if there is reasonable cause to believe the AMO Code and/or the IREM Code of Professional Ethics may have been violated. Ultimately, a firm's accreditation can be terminated or suspended, or a letter of censure could be issued for violating the Code. The purpose of this Code of Ethics is to establish and maintain public confidence in the honesty, integrity, professionalism, and ability of the professional real estate management organization. The Institute of Real Estate Management (IREM®) and its Members intend that this Code and performance pursuant to its provisions will be beneficial to the general public and will contribute to the continued development of a mutually beneficial relationship among Accredited Management Organization (AMO®) Member Firms (AMO® Firms), and other Members, national and international professional real estate associations and organizations, clients, employers and the public. The Institute of Real Estate Management, as the professional society of real estate management, seeks to work closely with all other segments of the real estate industry to protect and enhance the interests of the public. To this end, AMO® Firms of the Institute have adopted and, as a condition of membership, subscribe to the AMO® Code of Professional Ethics and the IREM® Code of Professional Ethics. To advance professional real estate management through the mutual efforts of AMO® Firms of the Institute of Real Estate Management and by any other proper means available. To maintain the highest moral and ethical standards consistent with the objectives and higher purpose of the Institute. To comply with the principles and declarations of the Institute of Real Estate Management as set forth in its Bylaws, Statement of Policies, the AMO® Code of Professional Ethics and the IREM® Code of Professional Ethics. 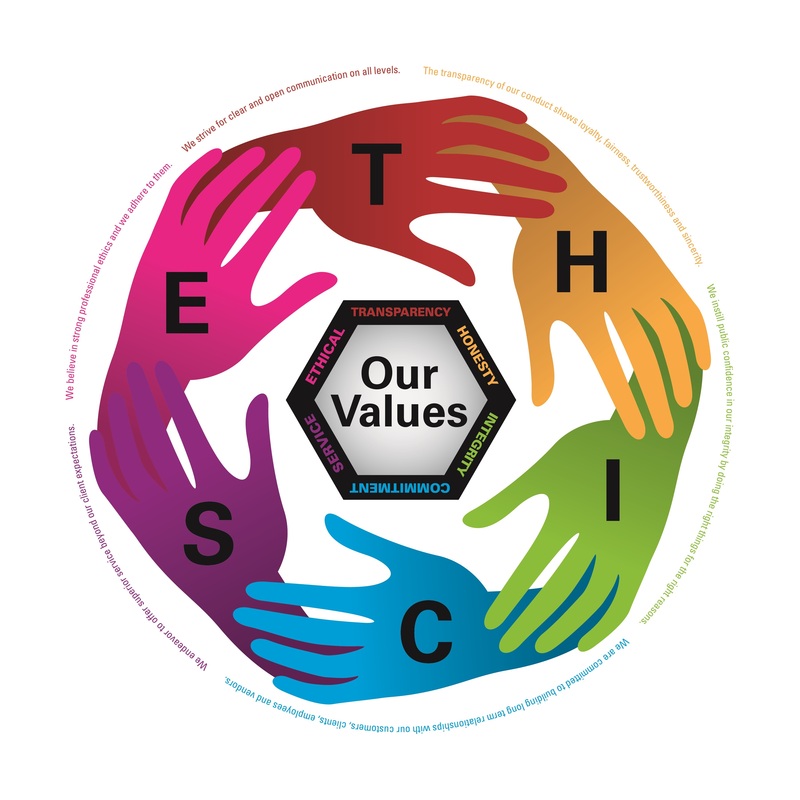 E- Ethical- We believe in strong professional ethics and we adhere to them. T- Transparency- We strive for clear and open communication on all levels. H- Honesty- The transparency of our conduct shows loyalty, fairness, trustworthiness and sincerity. I- Integrity- We instill public confidence in our integrity by doing the right things for the right reasons . C- Commitment- We are committed to building long term relationships with our customers, clients, employees and vendors. S- Service- We endeavor to offer superior service beyond our client expectations. IREM is the only professional real estate management association serving both the multi-family and commercial real estate sectors and has 80 U.S. chapters, 13 international chapters, and several other partnerships around the globe. Worldwide membership includes more than 19,000 individual members and 550 corporate members. IREM promotes ethical real estate management practices through its credentialed membership programs, including the Certified Property Manager® (CPM®) designation, the Accredited Residential Manager® (ARM®) certification, the Accredited Commercial Manager (ACoM) certification, and the Accredited Management Organization® (AMO®) accreditation.